Troll fail. Also reported considering that absoulutely NO topics are supposed to be started about Herobrine. oh meh dident know that. how do i delete? Please click this. Don't worry, it's not a screamer or any crap like that. Herobrine does not exist, he never did. Location: Probably somewhere around here? Because he is a ghost! Herobrine related topics are spam. Don't post them, he's not real. No encounters, but, I am an co-owner of an server, and, we have the citizens plugin, and, I spawned an npc (non-playable-character) with the name of "Herobrine,", and, it spawned him, he had the normal monster, or, "steve,", skin, but, the eyes were completely white. 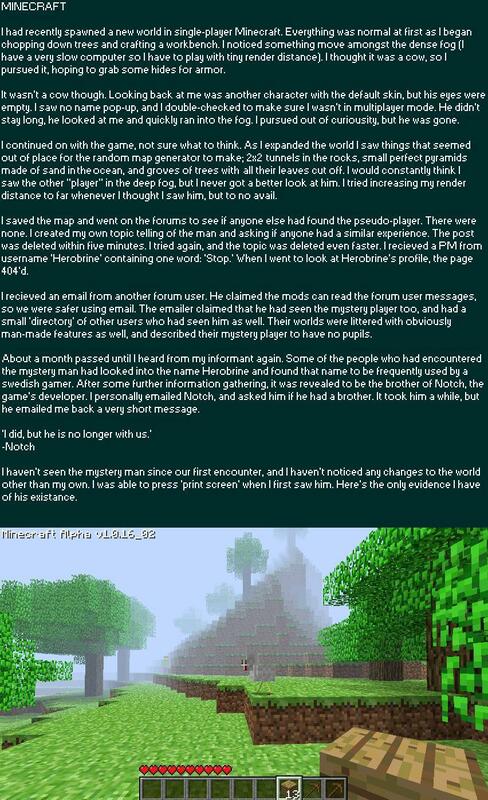 Herobrine is fake, an figment of imagination crafted by trolls that jack to old time npc anna all day long. Summoning him brings up spam, the only way to summon him is with mods, or, this plugin Click here. If facebook, Myspace, and Twitter were all destroyed, 90% of teens would go insane. And when that happens, the 10% of us who didn't go insane will be laughing at them. OMG NOW I TOTALY BELIEVE YOU. I DIDN'T BEFORE I SAW YOUR EVIDENCE! WE MUST WARN EVERYONE!!!!! FBI: OLOLOLOLOLOLOL!!!!!! Y U NO TEL US B4????? if so or if not what do u think?